Today, on the calendar used in the LC-MS, is recognized as the Commemoration of Johannes Bugenhagen. 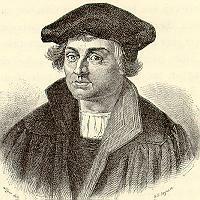 Born in Eastern Pomerania in June 24, 1485, Bugenhagen studied humanism in Greifswald and was ordained as priest before holding diverse positions as teacher of the Holy Scriptures and of the early fathers of the church. Initially Luther’s anti-Roman paper “The Babylonian Captivity,” published in 1521, was met with total rejection by Bugenhagen. After intensive study of this hypothesis, he did however become a firm supporter of the Reformation Movement and moved to Wittenberg. “Doctor Pommer,” as Luther called him, became one of the most effective reformers. He became the pastor of St. Mary’s in Wittenberg in1523 becoming Luther’s personal spiritual adviser, confessor and pastor. He also was a theology lecturer at the Wittenberg University. Bugenhagen was an exceptionally good organizer and indispensable for the Reformation in northern Germany and Scandinavia. He founded a church polity for Braunschweig, Hamburg, Luebeck, Pomerania, Schleswig-Holstein, Hildesheim, Braunschweig-Wolfenbuettel and Denmark; he even helped with the initiation and realization of the polity in these areas. They not only regulated the worship service, but also far reaching things such as the educational system and social matters. In 1539 Bugenhagen was made superintendent general of the Electorate of Saxony. Bugenhagen was one of the greatest scholars of the Reformation era, and helped translate the New Testament into Low German. He wrote a commentary on the Psalms and his work on his “Passion History” was extremely influential. After Martin Luther’s death, Bugenhagen took care of Luther’s widow and children. Johannes Bugenhagen died in Wittenberg April 20, 1558. His tombstone can be seen in the City Church in Wittenberg. Northwoods Lutheran, a blog, has a post from 2009, which gives more background on Bugenhagen. The link below will take you to it.